With the proliferation of bring your own device policies, the challenges to IT managers trying to provide productivity apps to workers across a variety of devices is becoming even more daunting. But a new service from Stamford, CT-based InstallFree called Nexus, going live today after completing its public beta, is taking on the challenge by providing access to a suite of apps including Microsoft Office (s msft), Adobe Reader (s adbe) and others, from a browser. The service allows user access to cloud-based applications in order to create, edit and share their files online without having to download any applications or clients. Nexus connects to existing online storage services including Dropbox, Google Drive (s goog), Box and Skydrive through a virtual file system, so they can tap resources and files that they’ve already stored in the cloud. Users can also access any sites that rely on Flash, Java or Siverlight through Nexus. Nexus, which has been used by 30,000 people in its five-month public beta, works on the iPad (s aapl), Chromebooks, Android tablets and any PC, Mac or Linux-based computer. In addition to creating and editing files, the service makes it easy to share them online with others, by posting a link on Facebook (s fb), Twitter, LinkedIn (s lnkd), Google+ or through email. 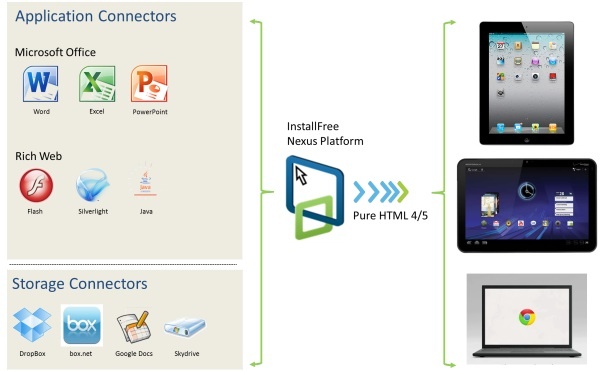 What makes Nexus interesting is that it’s a pretty light-weight way to enable cross-platform collaboration, though it requires a good connection. But it has plenty of competition. CloudOn also provides access to Microsoft Office on tablets, but it requires a download of an iOS or Android application. OnLive Desktop provides users with access to their own desktop with Microsoft Office and other tools, but that too requires a download. There’s also other mobile apps that allow remote PC access, which is another option to use productivity apps on a mobile device. Users can use a free version of Nexus Basic that offers access to LibreOffice (formerly known as OpenOffice) to create and edit files; full viewing of Microsoft Office documents and access to Dropbox, Google Drive, Box, SkyDrive, SharePoint, Office 365 and other storage services. Nexus Premium will sell for $4.99 a month or $49.99 per year for an academic license per person or $19.99 a month or $199.99 a year for a standard license for one person. Premium users will get all of the Basic services along with full licensed access to Microsoft Office 2010 including Word, Excel, PowerPoint and Publisher. InstallFree, which has raised $15 million to date, is building off the work it’s done in virtualization, providing remote access to Windows applications. The company is hoping to target small and medium sized businesses with Nexus, said Gabay, but it could also look to partner with a telecom operator, who can offer the service for business customers. InstallFree Nexus is another sign of how the computer is evolving in the post-PC era, now that there are more ways to access services via the cloud. Workers will increasingly be able to do most of their work via tablets that connect to traditional desktops and productivity apps.